"A brave, deep, and exemplary detailed work that investigates happiness in all its aspects, charts new grounds in understanding happiness, both individually and socially, and provides a wealth of solid resources for readers seeking real, substantive, and lasting personal happiness. Truly indispensable and highly recommended!" The Columbia Review. 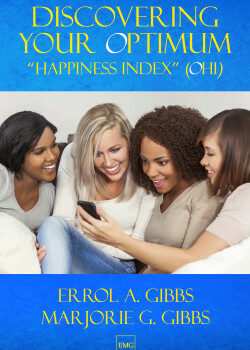 Notably, while Discovering Your Optimum “Happiness Index” (OHI) explores the most fundamental questions of human life, the text is highly readable and easily accessible to the everyday reader. The authors share relevant experiences from their lives and personal journeys, while also leading the reader on a journey of discovery and exploration. The work draws from rich and varied sources, and provides some of the most potent (and beautiful) quotes from history’s best thinkers. Our favorite: “The secret of happiness, you see, is not found in seeking more, but in developing the capacity to enjoy less.” ― Socrates (469-399 BCE). Compounding the benefits of this book’s wonderful examination of happiness in all its stunning human colors, the authors do not shy away from providing the reader with well-founded pathways to self-improvement that would be unquestionably beneficial—truly a multi-tiered gift that can change one’s quality of existence with a healthier and happier life. There are personal examples of what makes the authors happy, self-assessment and improvement opportunities, and breathtakingly broad discussions, quotations, citations, and sources, as well as practical tools, questionnaires, lists and exercises. In summary, this is a brave, deep, and exemplary detailed work that investigates happiness in all its aspects, charts new grounds in understanding happiness, both individually and socially, and provides a wealth of solid resources for readers seeking real, substantive, and lasting personal happiness. Truly indispensable and highly recommended!